First Pro Game and First Win for Luukkonen · Let's Go Amerks! The Ukko-Pekko Luukkonen era in the organization started Sunday afternoon when he played his first professional game and earned his first professional win with 32 saves against the Belleville Senators. 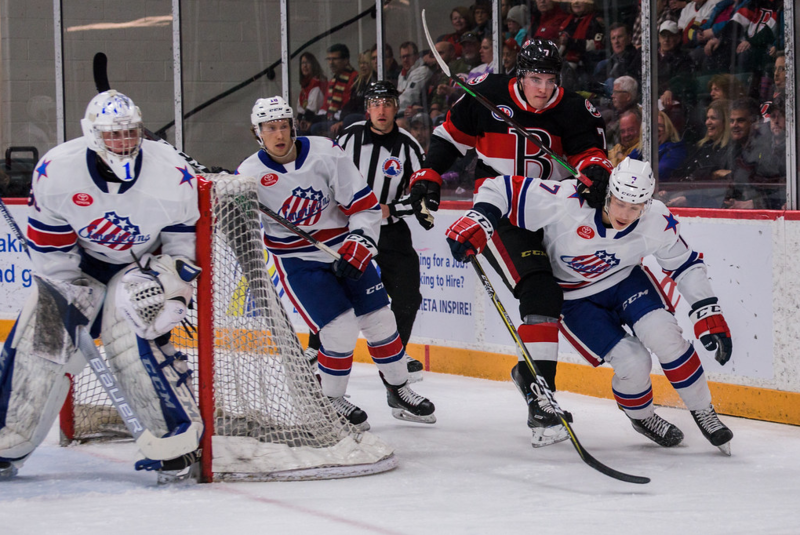 The Amerks won 4-2 fueled by three power play goals and five players from the Cincinnati Cyclones filling in roster spots. Luukkonen finished the game with 32 saves for his first win and was challenged throughout the game. He made the saves when they were needed and looked like he’s played in the position all season. Two goals against were scored glove side but after that he settled in and looked confident between the pipes. Logan Brown scored the first goal of the game with a quick wrist shot in front of Luukkonen to beat him glove side. The Amerks started to lead the game after that goal and Taylor Leier scored two power play goals within a span of three minutes and six seconds to give them the lead. Those were his 21st and 22nd goals of the season. The first goal he received a pass with his back to Marcus Hogberg, spun around, and buried the puck through the pads. His second goal was text book power play setup. Three quick passes around the box and Leier was on the goal line to score down low. Jack Rodewald scored at 2:16 of the second period to tie the game 2-2 scoring high glove side on Luukkonen. Tage Thompson had lead a rush down ice for a scoring chance. Belleville retrieved the puck and lead a fast transition down ice to setup the goal. A third power play goal for Rochester gave them a 3-2 lead when Tage Thompson was able to blast a shot past Hogberg with 5:35 remaining in the second period. Kurt Gosselin earned the primary assist, his third assist of the season, with the pass to Thompson. Kurt Gosselin finished the regular season with assists in three straight games. Casey Fitzgerald scored his first professional goal with a big blast from the blue line. Taylor Leier delivered the pass, Fitzgerald wound up, and Hogberg probably had to guess where it could go. Moments before Fitzgerald scored a puck had gone off a post in the Amerks end. The net was wide open and a Bellevile player hit the post. They could have tied the game but the play turned back the other way and that was the game. Fitzgerald scored and Amerks would go on to win 4-2. Overall it was a loose playing Amerks road team with a shell of a lineup that normally plays. Belleville was playing for their playoff lives and was probably gripping their sticks too tight. It was the first win of the season for Rochester over Belleville. The Amerks tied a franchise record with their 25th road win of the season and finished the regular season with 46 wins and 99 points. Four of the six Calder Cups won by the Amerks have been by teams with 46 or more wins. There’ll be more to come with season recaps and playoff previews!